All transactions are safe and secure with a reliable history in online purchasing behind each of our associates. 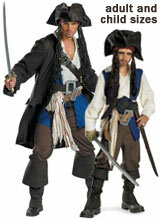 Buy the Jack Sparrow Pirates of the Caribbean Costumes, Wigs, Hats to own Pirates of the Caribbean clothing and merchandise. These child and adult officially licensed Disney, Pirates of the Caribbean masks and costumes will capture the attention of your friends. Gruesome tentacles adorn the Davey Jones adult mask while the Blackbeard hat perfectly caps off the thick Blackbeard costume wig. Portray other characters including Angelica Malon, Elizabeth Swann and the Quartermaster from Pirates of the Caribbean: On Stranger Tides and The Dead Man's Chest. Find the ideal costume for raiding your next Halloween party. In addition to the Jack Sparrow Pirates of the Caribbean Costumes, Wigs, Hats above, browse the Pirates of the Caribbean Clothing Gallery for more apparel like men's and women's clothes, kids shirts or hoodies.